Scientists say they have pinpointed genetic changes that allow some Ethiopians to live and work more than a mile and a half above sea level without getting altitude sickness. The specific genes differ from those reported previously for high-altitude Tibetans, even though both groups cope with low-oxygen in similar physiological ways, the researchers report. If confirmed, the results may help scientists understand why some people are more vulnerable to low blood oxygen levels caused by factors other than altitude — such as asthma, sleep apnea, heart problems or anemia — and point to new ways to treat them, the researchers say. Lower air pressure at high altitude means fewer oxygen molecules for every breath. “At 4000 meters, every lungful of air only has 60% of the oxygen molecules that people at sea level have,” said co-author Cynthia Beall of Case Western Reserve University. To mop up scarce oxygen from thin air, travelers to high altitude compensate by making more hemoglobin, the oxygen-carrying component of human blood. But high hemoglobin comes with a cost. Over the long term, excessive hemoglobin can increase the risk of blood clots, stroke, and chronic mountain sickness, a disease characterized by thick and viscous blood. “Altitude affects your thinking, your breathing, and your ability to sleep. But high-altitude natives don’t have these problems,” said Beall, who has studied high altitude adaptation in different populations in Ethiopia, Peru and Tibet for more than 20 years. “They don’t wheeze like we do. Their thinking is fine. They sleep fine. They don’t complain of headaches. They’re able to live a healthy life, and they do it completely comfortably,” she added. Research over the last four decades has revealed that people born and raised in mountainous regions cope with altitude in different ways. Native highlanders in Tibet and some in Ethiopia, for example, are able to maintain relatively low blood hemoglobin concentrations at high altitude compared to their counterparts in the Andes, a trait that makes them less susceptible to chronic mountain sickness. Tibetans and some Ethiopians have both evolved a dampened response to low oxygen, explained study co-authors Anna Di Rienzo and Gorka Alkorta-Aranburu of the University of Chicago. The researchers wanted to pinpoint the genetic changes that enable Ethiopians to thrive in thin air, and to see if the same genes play a role for Ethiopians as found in recent studies for Tibetans. To find out, they analyzed the genomes of nearly 260 Ethiopian villagers belonging to two ethnic groups: the Oromo, who began settling at high altitude in the Bale Mountains of southeast Ethiopia about 500 years ago, and the Amhara, who have lived at high altitude in the Semien Mountains of northwest Ethiopia for at least 5,000 years. Research by Beall and colleagues in the early 2000s revealed that Oromo cope with thin air in much the same way that lowlanders visiting high altitude do — i.e., by making more hemoglobin. In contrast, Amhara highlanders — whose ancestors have inhabited mountainous regions for thousands of years longer than the Omoro — are able to maintain blood hemoglobin levels that are roughly 10% lower than Omoro living at the same altitude. In a study to appear in the December 6, 2012 online issue of the journal PLoS Genetics, a team led by Beall, Di Rienzo and Alkorta-Aranburu analyzed both groups’ DNA, which was extracted from blood and saliva samples donated by Amhara and Omoro villagers born and raised at high (3700-4000m) and low (1200-1560m) elevations. 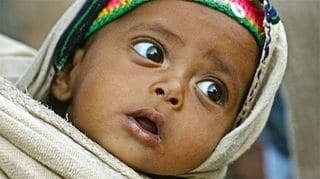 Using a statistical technique called a genome-wide association study, the researchers scanned the genomes of highland and lowland Ethiopians from both ethnic groups in search of variants associated with hemoglobin levels in the blood. When they scanned the villagers’ DNA, the researchers found a genetic variant associated with low hemoglobin levels in the Amhara. This variant was located in a different region of the genome than those previously found to be associated with low hemoglobin in Tibetans. In other words, the physiological coping mechanisms shared by Amhara and Tibetans in response to life at high altitude — ie., dampened hemoglobin levels — are due to different underlying genes. It is still unclear whether the first settlers of high altitude regions in Ethiopia and Tibet carried different genetic variants with them when they arrived, or whether different mutations occurred in these populations after they got there. But it’s clear that each group followed a different evolutionary pathway. “They have a similar physiologic solution, but that doesn’t necessarily amount to a similar genetic solution,” Di Rienzo said. For the Omoro — who are relative newcomers to high altitude — the researchers also found differences between highlanders and lowlanders in DNA methylation, a chemical process that causes changes in gene activity, but doesn’t necessarily alter the genetic code. While the differences aren’t linked to hemoglobin levels, the results suggest that such changes may play a role in the early stages of high altitude adaptation, the researchers say. Oromo lived only 500 years ? Where did you get the data? That is tottaly wrong analysis please do not write based on political propaganda of 500 years. Oromo lived there for thousands years ago.